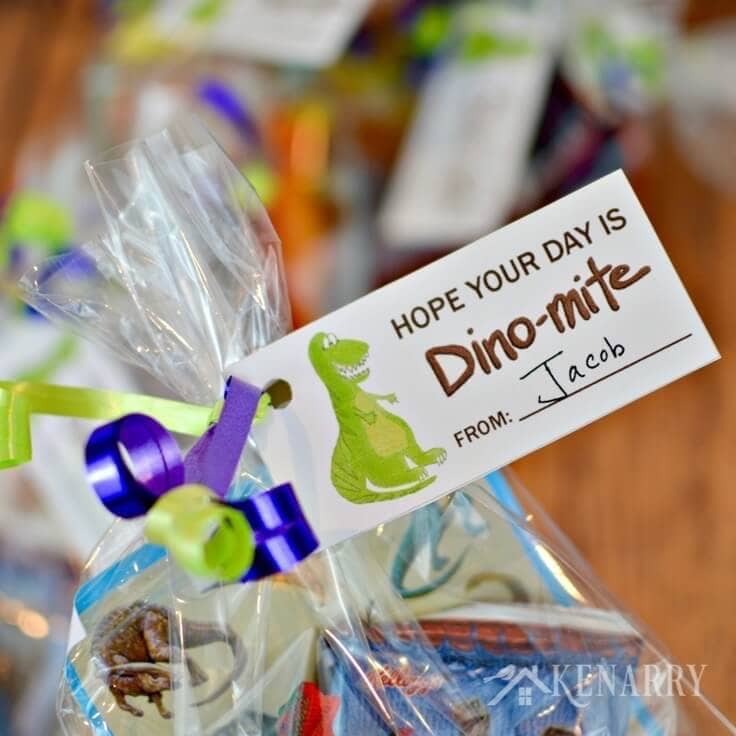 Create Dinosaur Party Favors for children using this free printable treat tag. It’s a great idea for a kid’s birthday or Valentine’s Day at home or school. Are you hosting a dinosaur themed birthday party for your son or daughter this year? 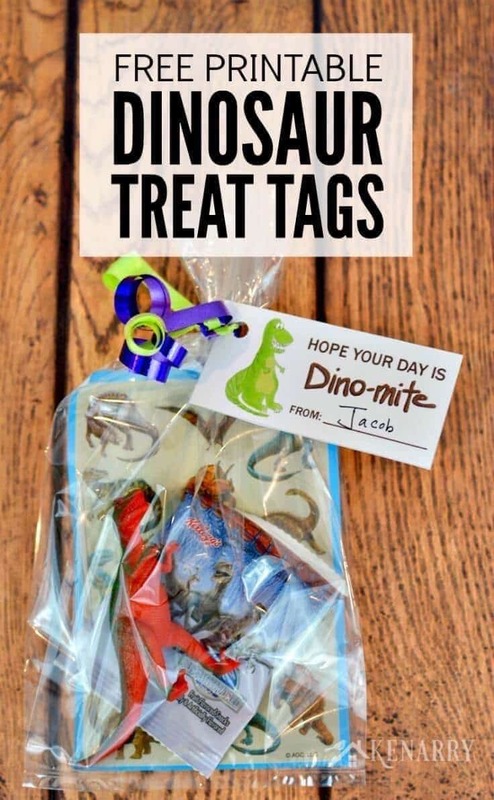 Today we’re sharing free printable tags so you can easily make dinosaur party favors for a dino-mite special event. Our youngest son, who we refer to as “C2” on the blog, is going to 3-School or preschool this year. It’s his first year in school, but he’s eagerly watched his older brother bring birthday treats to school the last few years. He was so excited when he turned 4 several weeks ago and it was finally HIS turn to get to bring a birthday treat to school. Like many boys his age, C2 is into DinoTrux on Netflix, Dinosaur Train on PBS and anything and everything related to dinosaurs right now. When I asked him what kind of theme he wanted for his 4th birthday, he knew immediately — DINOSAURS! I’ll share C2’s dinosaur crazed birthday cake in a few weeks but first we needed to figure out a dinosaur treat he could bring to preschool. In C2’s mind, his birthday treat needed to be just like the Star Wars Party Favors his big brother brought to school for his last birthday — a cellophane bag filled with stickers, fruit snacks and other treats. The two of us went on a hunt for the perfect dinosaur goodies to include in his birthday treats. Lucky for C2, we were able to find a big bucket of 40 dinosaurs at Walmart for less than $10. This gave us enough to give one to each of his classmates with plenty leftover to use on his dinosaur birthday cake. We also found a big assorted pack of dinosaur stickers and Jurassic World fruit snacks at our local store. Once we had the dinosaur goodies, the next step was to create a “dino-mite” tag that C2 would love. A few months ago, I got a new 12.9″ iPad Pro specifically so I could start drawing and creating my own art to use on printables, tags etc. I used the free Adobe Sketch app and an Apple Pencil to create a little green T-Rex for the dinosaur party favors. 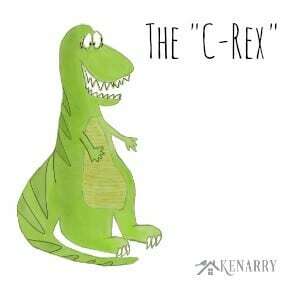 As you can imagine though, I told my son THIS one is called a “C-Rex”. You should have seen him grin from ear to ear that the dinosaur was named for him. He was thrilled! 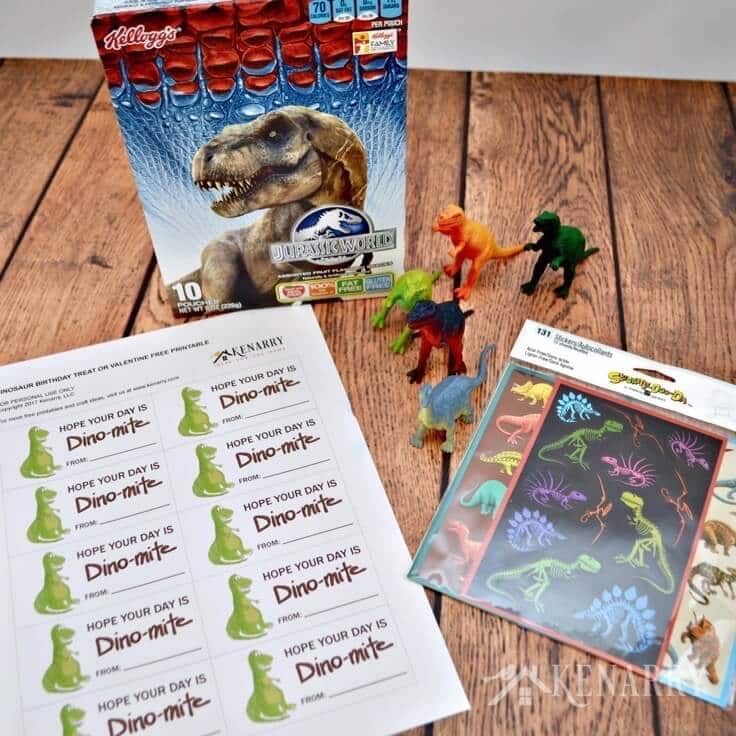 If you want to use the C-Rex tags for your own dinosaur party favors, they’re available as a FREE digital download exclusively for Kenarry Idea Insiders. 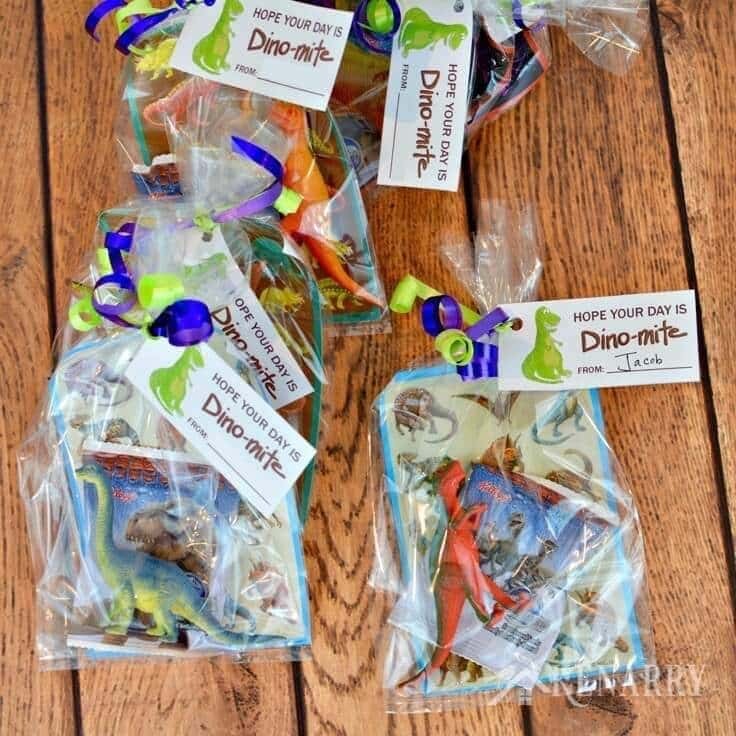 This birthday treat idea works great as party favors if you’re hosting a dinosaur themed party for your child’s birthday at home or school. The dinosaur party favors would also be cute as valentine cards with or without candy or trinkets. 1. Get the tags for the Dinosaur Party Favors. 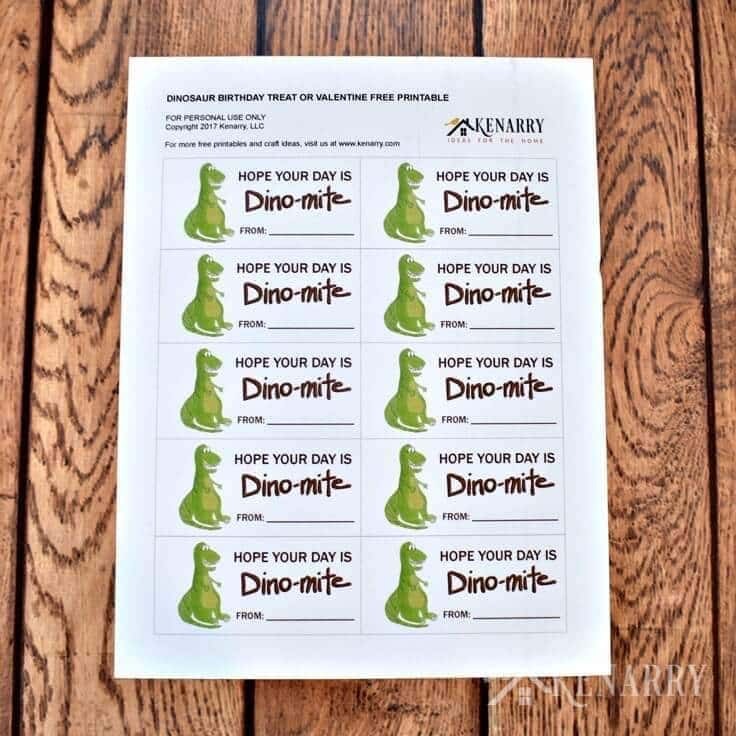 The printable dinosaur party favor tags are available as a FREE gift when you sign up below! Then you just need to download the PDF file and save it to your computer. 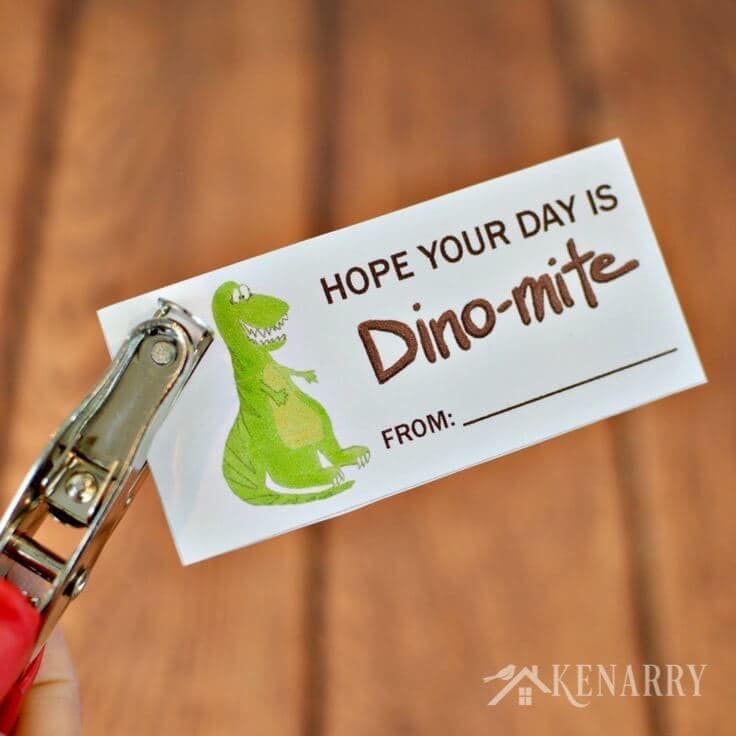 The dinosaur party favor tags and all other free printables from Ideas for the Home by Kenarry™ are for your own PERSONAL USE ONLY. 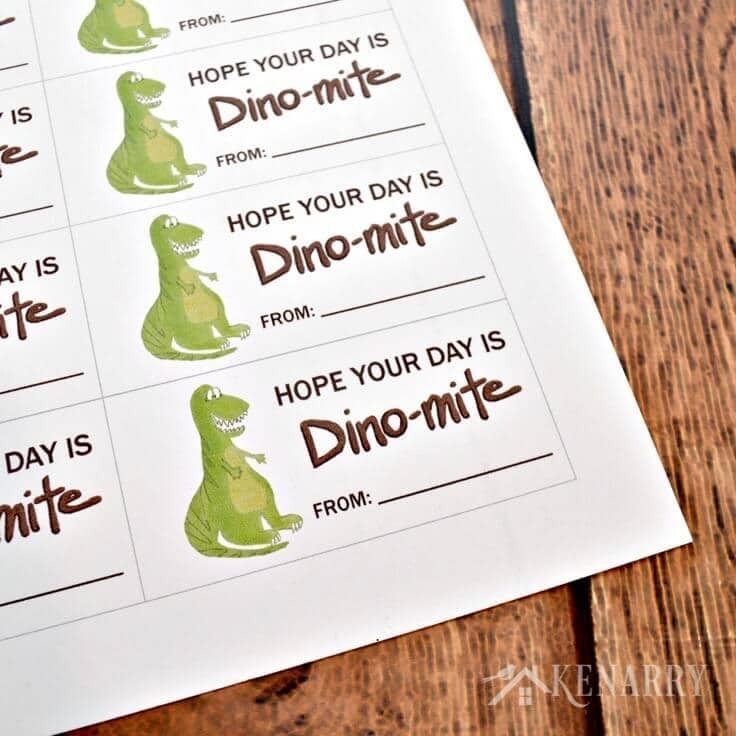 Once you have the file, print the tags for the Dinosaur Party Favors on white card stock. 2. Cut and punch the tags for the Dinosaur Party Favors. Cut the tags apart with scissors or a paper trimmer. Next, use a single hole punch to put a hole in the corner so you can tie the tags onto the Dinosaur Party Favors. 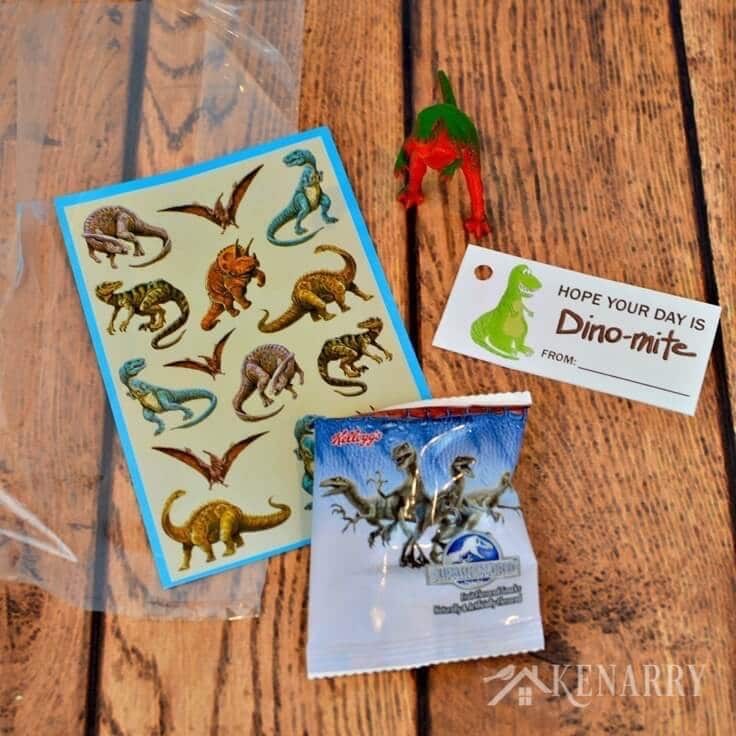 Gather the dinosaur fruit snacks, plastic dinosaur toys, stickers or other goodies for the dinosaur party favors. Put one of each item into a cellophane bag. Then continue to do so with the remaining bags until you have filled enough for your child’s class or birthday party guests. 4. Tie the tags on the Dinosaur Party Favors. Cut the ribbons to the size you need. Make sure it’s long enough for curling or tying (whatever your preference is). Lace the ribbons through the hole in the dinosaur printable tags. Next tie the ribbons around the top of each cellophane bag. If your child is in preschool, like my son, you may want to tie the knots loosely. 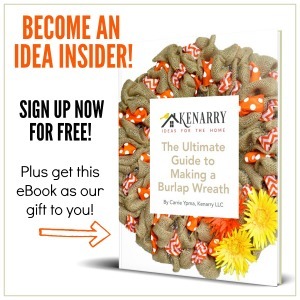 Small children don’t have the fine motor skills or patience for tough knots. 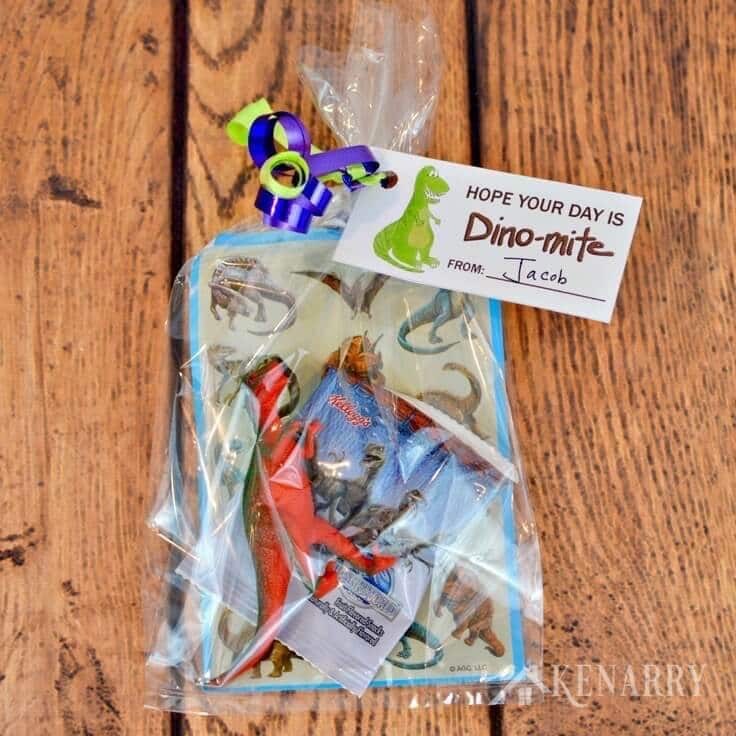 Use scissors to curl the ribbons, if desired and you’re done with this quick dino-mite birthday treat idea! Now you have a fun dinosaur treat to give your child’s friends at school or as a birthday party favor. You could also use this printable for your child’s classmates as Valentine’s Day cards. What kind of creative birthday treats have you made for your child’s classmates? Please comment below and share. We’re always looking for new ideas! These treat bags are so adorable. I bet he was a big hit with these. He really was a big hit! Thanks, Beverly! Those are too cute! Thanks so much for sharing this with us at the DI & DI Link Party, loved seeing an sharing it. Thank you, Christine! So glad you came by and thrilled that you’re sharing our dinosaur party favors! These are super cute. It so fun for the kids to be able to share their birthday fun with classmates. Thanks for sharing this on Merry Monday. Thank you, Erlene! My boys love bringing treats to share with their friends for their birthdays. So glad you came by from Merry Monday!